Ok, I've made an executive decision on the future of the site. I asked for some input on the new style and look of the site and am thankful for the few responses I did get. I have decided that we will be moving forward with the "DVG" style. Creating a fixed width site, in a world where computer monitor sizes vary so much is foolish in my opinion. It is a waste of screen real estate and makes viewing on devices like phones and tablets more difficult to read when font is small. Since it's start, our site has been styled in tables. Tables have always been the easiest and fastest way to make the site run and allow me to make quick changes while not having to really know or learn php or css coding. However, the days of tables has come and gone. Tables are essentially hundreds of small pictures that come together to make the web page you were viewing. They were slow to load, and very pixelated as well as glitch prone. Putting the site together inside the php style will take me longer to complete, but will load much faster and have a better search feature. It will also allow me to password protect some sections of the site, while leaving other pages open. Fortunately, or unfortunately (depending on which style you liked best) the simplicity of the DVG style and lack of extra banners and background images makes learning php and css coding much easier for me, making the rebuilt go faster. More pages are in the works of course. The forums will be getting a clean up. The new security settings will be adopted and ranks will be formed based on member group and post counts. No current members will loose access, but future members will only gain access based on rank driven post count. This will allow us to remove the anti spam settings on user registration and thus not be bothered by spam bots. More in the works. Look for the new home pages soon. Where's the control panel link? Also pictures are not correctly resized. The search box is too dark and almost unreadable. Glenn, this theme is built on prosilver, so it should work more like the original style we had. User control panel is in the top right corner. Moderator control panel is in the bottom left corner. Search box should be a simple fix to make white, kinda seems silly that they made it black to start with. I'll have to fix the ReIMG code. It probably broke when I updated the theme, or did the last update... Not sure when. I was just tinkering for a few hours, taking a break for the night will fix those items next. Site looks nice with clean lines! Thanks Mike. So far so good.... thanks for all the hard work! Header text has been repaired to elimiate navigation issue when using the "DasVolks Gruppe" text to navigate to board index. Will be redirecting to home page soon. The ReIMG mod to make all photos fit in the post is repaired. If you notice any glitches, please notify me in this post. Well, if nothing else by the end of this I will have taught myself how to code php and css by trial and error. The events page is now running. There is a list of identical shows in there for now, just to hold my templates. AoT wrote: Appreciate the effort Mike!! Looks great. Nice simple layout. Connections to our Google Maps API are in. Map feature is now turned on, and is working. Lets start to talk about the show list for 2014, so I can set the names, show links, and maps to their correct targets. 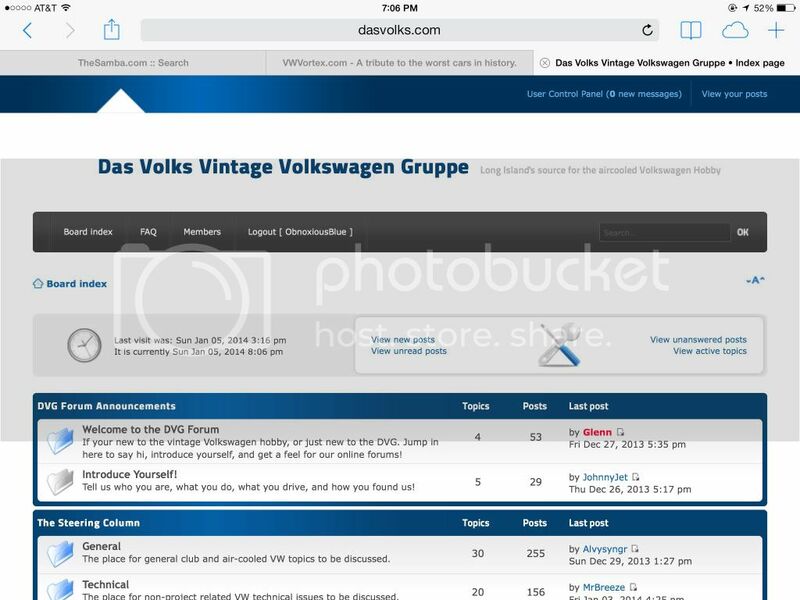 The blue "Das Volks Vintage Volkswagen Gruppe" is now set to go to the home page. This will be the main way to navigate back to the home page once the site has completely migrated to the new phpbb theme. Get used to using the "Board Index" button to get to the Forum Index. CSS is much more straightforward but PHP has a steeper curve. You are doing great! thank you for the hard work Mike! PHP is a bit easier if you can read and sort your way through html. If you need to change a specific color but can't find it because the CSS file is HUGE and messy one cheat I have learned is to grab a screen shot and open it in photoshop - use the eyedropper and get the color code. Do a quick search and bam. Memberlist error is fixed. Now, clicking "members" on the nav bar, followed by selecting a list from the alphabet bar won't trip a general error. Thank you Mike! New layout looks good! being computer retarded as i am, this site looks awesome and is user friendly, Please keep up the good work! I knew a guy who sold PHP once. Tom wrote: I knew a guy who sold PCP once. what s his number!!! i need to get to some of these get togethers! ObnoxiousBlue wrote: PCP? Party at Toms! Better than a Roofie party at Mikes. Until you try to walk!